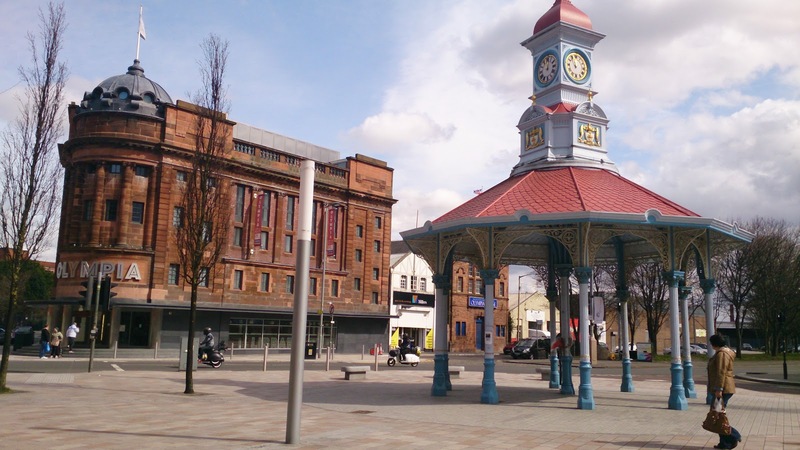 Glasgow Punter: East End Entertainments In Glasgow. Review of Outskirts Festival, Platform. Easterhouse and BFI Mediatheque, Bridgeton Olympia Library, Glasgow. Last year's inaugural Outskirts Festival was a sell out. No surprise with popular acts such as Aidan Moffat, Vashti Bunyan and readings from the likes of William Letford that time around. This year the festival stuck more closely to its own goals as "a venue on the outer reaches of a major city ought to doff its cap to artists on the edge of their disciplines or those creative people who are simply too curious to stick to one artform". They had advertised it as "recommended for the whole family". So taking them at their word we headed to the Platform as a family. There were options to include food in the ticket price and price reductions available if you had "local links". I was going to claim this on the fact that a decade ago I had spent a year working in Easterhouse but in the end "local links" just meant having a Glasgow postcode. The venue is not one I'd been to before. It is part of the Bridge complex in Easterhouse, which also includes the swimming pool, library, John Wheatley college and plays host to Scotland's National Youth Theatre. We decided to make a day of it in the east end and started at Bridgeton Library. 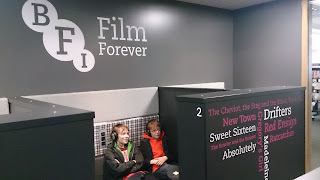 This recently re-opened in the former Olympia cinema and music hall building right at Bridgeton Cross and includes Scotland's "first BFI Mediatheque". This is a film and television archive from Scottish Screen and the BFI. Armed with just your library ticket you access this at a computer screen in wee booths in a dedicated section of the library. The choice is so wide and varied the hard part is deciding where to start, whether you go for old 50s Horlicks adverts and documentaries about Glasgow shipbuilding or the first episode of TV show Swap Shop. There are films too, from Gregory's Girl to Great Expectations. We ended up dipping in and out of a lot of things but our collective favourites were footage of the 1908 London Olympics and watching Peter Cushing as Doctor Who in Dalek Invasion Earth 2150. 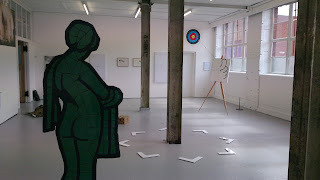 We also wandered round the corner to a gallery which has been open for a couple of years in an industrial building here but which I only heard about when there was a feature on it in The Skinny this month. 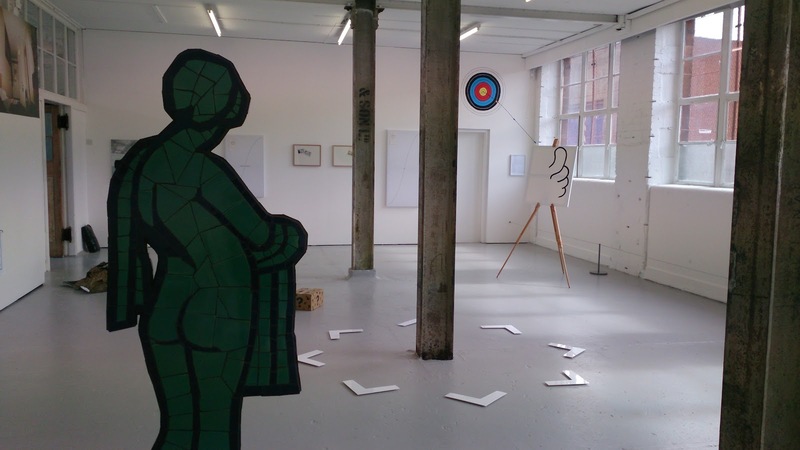 The David Dale Gallery was hosting an exhibition by Harry Meadley featuring some other Leeds based artists. You wouldn't stumble across the gallery by accident unless you had come here on purpose but it is certainly worth seeking out. After this we swung past the Modern Institute in Osborne Street which has an exhibition just now of paintings by Swiss artist Nicolas Party. From here we could pop around the corner to get a vegetarian lunch at Mono and join in the fun of Record Store Day, the day when lots of men with beards queue up at record shops to buy vinyl they don't want but hope to flog later on ebay. Mono were also running a bus to Easterhouse for the Outskirts Festival, so wiping the last falafel crumbs from the corners of our mouths we headed for it. As I'm visiting Denmark and Holland during the summer I was drawn by the chance to hear Danish Frisk Frugt (it means fresh fruit apparently), and Dutch performer/ musician Jaap Blonk. A Hawk and a Hacksaw's Balkan-influenced folky music was also a draw and the chance to hear a reading from Rob Newman, once part of The Mary Whitehouse Experience. There were other more eclectic offerings promised to and performance art promised throughout the evening. Jaap Blonk set the tone giving us a sound poetry recital. I've been to lots of sound poetry performances and I'm not convinced that it brings anything more than the reading of words or the playing of music could to tell a story or express an emotion. This was the first time that I'd forced it upon my three children though and their less filtered opinions are always interesting. They found it bonkers but amusing, which is probably fair enough. He gave us a history of Sound Poetry, from early 20th Century Russian to Dutch members of the De Stijl movement. 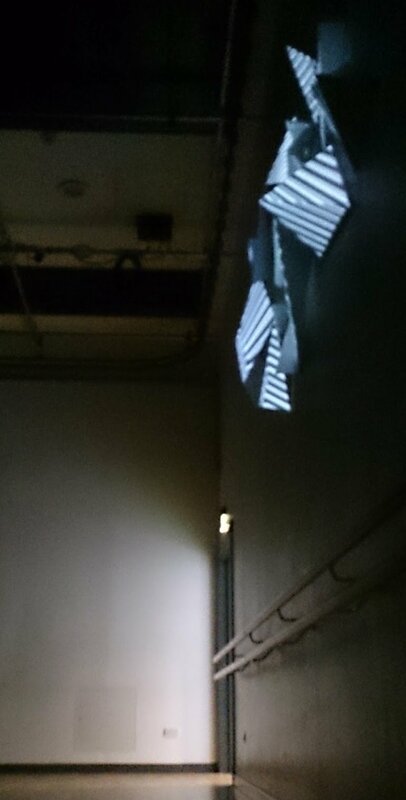 Between acts in one of the rooms Florence To played projections of geometric shapes onto white pyramids to a background of ambient electronic music. It was hypnotic stuff and the later performers got her to leave it on to add to their performances. Some of the other art on show was a bit hit or miss, although I did end up with a bag from the screenprinting Poster Club. In the main auditorium next up was "Sonata for a Man and a Boy" by Greg Sinclair and an excellent turn by young Bartek Bialucki. It was a performance involving movement, conversation and a cello lesson where the man's inner child and boy's adult interplay. It was gentle and engaging and warm and fuzzy without feeling the need to be dark or foreboding. A poetry reading by Ryan Van Winkle never quite hit the right note, whereas acapella singers Crying Lion, were note perfect and oddly one of my children's favourite performances with their olde England cider-appley sound. We were disappointed that Rob Newman wasn't well, as we'd been quite keen to hear him, but Scottish writer Kirstin Innes stepped in for him, reading her tales of social dancing torture at school. Frisk Frugt's latest album got a rave review in The Quietus so I was looking forward to hearing them. 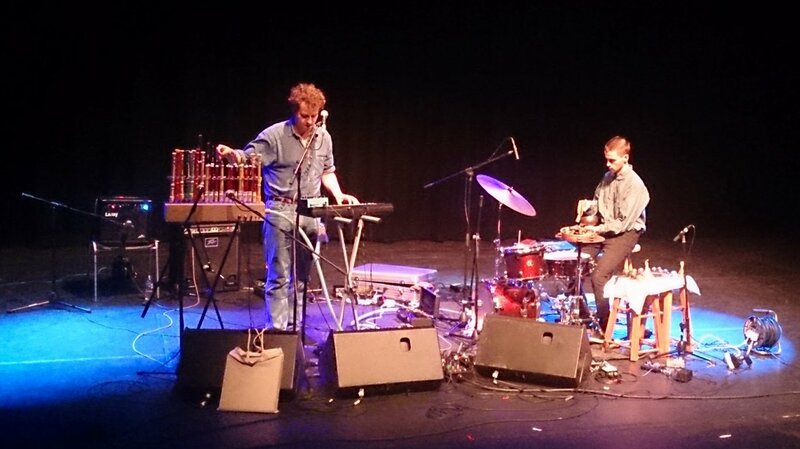 Danish musician Anders Laug Meldgaard comes from a country where jazz is apparently not a bad word, but also a country where it has not been allowed to stagnate and has positive influences on the experimental, jazz-tinged sounds of Frisk Frugt. 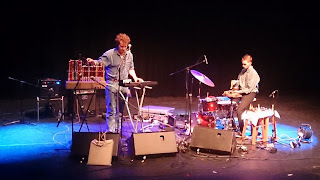 Driven on by his forceful percussionist who used a variety of bells, drums and chimes Anders moved from keyboard to mini-sax and his homemade organ put together from an array of swanee whistles and recorders. Their last piece was particularly impressive and beautifully put together, moving from chaos to order. This was definitely the highlight of my day. The evening was finished in style by A Hawk and a Hacksaw, the two-piece from Albuquerque, New Mexico rattling off their Balkan soaked tunes on violin and accordion. It was a foot-tappingly good performance but a bit unengaging for me. Central European folk music is not something I have a great handle on so it is hard for me to know where respectful imitation ends and original music making begins here. I think perhaps the setting didn't help this with the audience sat in the auditorium chairs looking down on the musicians. It was music that would be better heard sat around a fire with them or dancing in a village hall. Overall it was a well organised, interestingly curated festival. The atmosphere was pleasant and the unusual settling with library book shelves you could browse between acts and a sports centre cafe serving bottled beer and paninis worked well. It didn't feel like it had imposed itself on the area either but tried to engage with it. When a group of local boys kept wanting into things they were invited in without anyone fussing over it. Even after they ran out from the sound poetry guffawing theatrically I later saw Jaap Blonk and one of the festival organisers talking to them in a hall trying to show them how he makes his loudest farting noises. Other kids who had wandered in seemed to be getting a chance to do some screenprinting. Good effort all round, but maybe needs to work on the publicity a bit next year as this felt a bit like a wee secret. I was expecting a post about the various attractions on a day out to Falkirk. Well done the Jags rapping up the most competitive league in Scotland this year. Glasgow derby games return to the premiership, at the start of the season I thought it would be in Div 2. I'll go and crack open beer Chang in celebration. Enjoy your beer. I am letting it sink in first and may reflect on it once we get the trophy at Firhill next week after the Dunfermline game. Finished last night with a donner kebab and a bottle of bubbly - NOW you're jealous, eh?